I chanced upon this image on PostSecret, a site that features anonymous renderings depicted on postcards. Aside from the cartoon's graphic nature, the caption conveys a thought many practitioners may be carrying around but have been reluctant to admit. 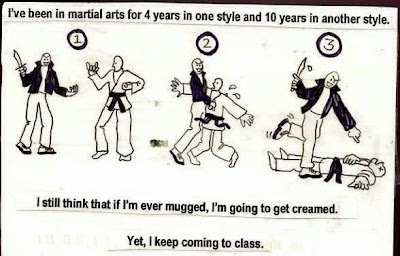 After years of dedicated martial arts training, there are those who feel they still haven't "got it". Holding a certain rank does not necessarily translate into having real confidence. But if we do feel confident - for whatever reason - then it tends to show, in and out of the dojo. It's been long known that robbers and especially bullies find their victims through analysis. Non-verbal cues can affect perceptions about vulnerability and ease of exploitation by criminals and the like. Unsynchronized walking strides, poor posture and the inability to make eye contact are dead giveaways to the potential attacker. So if you think you're fodder for an attack, your body language will likely communicate that notion. Conversely if you authentically feel good about yourself and your abilities, then that may be all that's needed to divert someone's intention to do you harm. In the meantime, keep training! Great post! I feel confident with my Brown Belt that if I had to, I could defend myself. Always walk with confidence and awareness of your surroundings and you make a less ealy mark for the potential attacker. I feel martial arts training should teach this aspect as well. I believe be it sport or combative training that both will serve well in the street if the practitioner can separate the two in their mind and practice accordingly. No one regardless of the type of training can actually say it works or not until they are in a combative situation. Even those who train in a combative form may still fail if their mind is not properly set as to intent and so on...no one knows till they come face to face with actual life threatening situations. Then all the training in the world will fail if they have not trained the mind properly. I agree. The first impression is normally the lasting impression. If you show that you basically are not going to take any abuse, there is a good chance that you wont. Good post! Always walk with confidence and awareness of your surroundings and you make a less ealy mark for the potential attacker. Awareness of your surroundings is the big one. Preventive measures goes a long way. Right you are. Intent is such a vital aspect in the martial arts, yet it's one that doesn't get much discourse. In Japanese, shin usually translates as heart or mind, but also intent. There's a difference in varying degrees of intent and to the sensitive person (not the mawkish kind) the difference can be felt ahead of time when it counts. The first impression is normally the lasting impression. And according to a school of thought, the first impression is the telling one if our intuition is operating properly. I have my daughter in martial arts to learn confidence, so she projects it. Self-defense is a nice side benefit, but not the primary reason. Self-defense is a nice side benefit, but not the primary reason. For kids, self defense could entail things like (as you said) projecting confidence, but also speaking up at critical times and even dealing with peer pressure. And quite often the lessons learned at an early age are the ones we carry throughout our lifetime. Aha! That's why they make camouflage gis!